Travelling with: Mitchell 9 and Lily 6 (going on 17). My family takes road trips north every winter and we always set aside two days to arrive from Sydney. 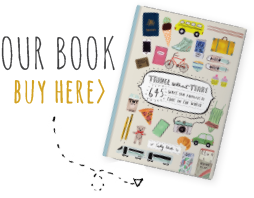 We try a new destination every year but all locations are close to the NSW/QLD border. We chose Kingscliff this year as it is close to Bryon, close to Mt Warning and close to Coolangatta airport (a quick dash to collect hard-working husband) and a friend had told me that the beaches are stunning. Our mid-way stop-over point is Macksville (a much better stop-off than Kempsie). We always stay in the Mandarin Motel, usually in the same family room. The kids love it, as it is like a home-away-from-home due to its familiarity. En route to Macksville this year we discovered Ricardoes Tomatoes, at Blackmans Point, just south of Port Macquarie and five minutes off the highway, where the the kids could pick their own strawberries. It was a major hit, and they requested to visit again on the return journey. Kingscliff is lovely and is still relatively underdeveloped (compared to Byron Bay) but still has great cafes, restaurants and shops (including a marvellous book store with a great children’s section). The beach is beautiful, especially if you enter a little north of the main town where it is quiet and the water is turquoise. We did a few day trips (all by car) and half-day trips from Kingscliff. The Crystal Castle at Mullumbimby is lovely but hideously expensive ($48 for myself and two children) and the cafe food was also pricey. After a hearty pub lunch, we hired a 1920s picnic boat at Tumbulgum (on the Tweed and Rouse Rivers) which my children took great delight in ‘captaining’. At maximum speed of eight knots there was no risk of making an unexpected landing at top speed! My son loved the nickname “Captain Cook”. We did a trip to climb Mt Warning (1167m). I was almost certain my six year-old would give up, but she made it to the summit after a three-hour climb, followed by a 1.5 hour descent. My son loved the last 400m of the climb as it really is a rock scramble and probably isn’t for the feint hearted. The climb was followed by lunch at a really special restaurant in Mt Warning called Mavis’s Kitchen. Imagine a stunning, well kept Queenslander house surrounded by gorgeous gardens, mainly vegetables and citrus trees, with Mt Warning as a back drop. The kids loved it! 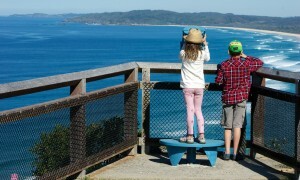 We also visited Byron Bay, hoping to watch whales from the Lighthouse. We were slightly disappointed as there wasn’t a lot of action at the time we were there. However, we did see a few breaches off the shore at Kingscliff. The rest of our time was spent in Kingscliff, walking along Cudgen Creek with kids on scooters, trying out stand-up paddleboading and just hanging out at the beach. Seeing my kids so excited by time at the beach…it’s the simple things that they love most. Long car rides can be taxing, however, as long as we have music playing or are listening to an audio book (the Roald Dahl series is fabulous) all is usually good. Occasionally, I download a movie for my daughter onto my iPad so that she can watch a movie. Readjusting to a different routine. I find always takes around four days to settle in to a new place/routine with kids. My children squabble a lot initially, but that tends to settle over time as they adjust to having so much time with each other and no other friends! When we reached the bottom of Mt Warning. Tumbulgum. What a cute little town on the Tweed River. Beautiful houses and a lovely child-friendly pub for lunch. The pub even had a fruit/veg stall which ran on an honesty system. Fins, at Salt (South of Kingscliff). Stunning menu and the kids’ meals were FABULOUS. I am so sick of seeing nuggets and chips and calamari and chips for kids meals. Stephen Snow has a great menu and was more than happy to chat among diners to see what we thought of his new menu. Probably do less. I always pack too much in. Great place. We’ll go back again.